Tomorrow marks 8 weeks of Julia taking medical marijuana for epilepsy. So far we feel she is doing awesome! I've written previously about our decision to start medical marijuana - which was primarily driven by our concern for what seven years of pharmaceuticals were doing to Julia's little body. In the 8 weeks she's been taking Haleigh's Hope we were able to wean her off of all other medications. So, for about six weeks she's only been taking marijuana, nothing else, and while it is still pretty new and her dose is fairly low, we think we are seeing a really promising response. So, Julia has been doing really well overall! In the past two weeks she had a few seizures - two were very clearly linked to her having the flu. She had a high fever and was throwing up all the medicine we were trying to give her to reduce her fever and so it made sense to us why she had the seizures and I honestly think she would have had them even if we had still been on Keppra. She had another seizure last week in speech therapy which we actually believe may have been stress induced. This is new for her and I think perhaps in the past Keppra might have been keeping this type of seizure at bay - I really don't know, I'm guessing. But bottom line, I don't necessarily view this as a negative because what we are seeing is a less doped version of Julia (ironic?) and perhaps as a result we are learning about some of her triggers we weren't aware of previously because the medication was dulling her response to life. So now we have a girl who is more in tune to her environment and we are, as a result, more aware of the risk that can come with her getting overly stressed. We may go up on marijuana at some point to increase the threshold of keeping this type of seizure away, but we can also do a lot on our own to try to minimize environmental stressors for her without just automatically going up, up, up on more and more meds. At this point in our journey with epilepsy I feel like we have a healthy understanding of our situation. 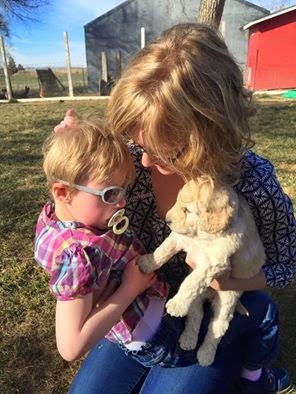 We know that because Julia was created with a uniquely formed brain she is always going to be at risk for seizures. There will never be a "cured from epilepsy" day for us this side of heaven. Even if the Lord blesses us with long stretches without seizures, like He has in the past, seizures will always be on our minds. It's not a lack of faith, it's a realistic understanding of our situation. And it is okay! 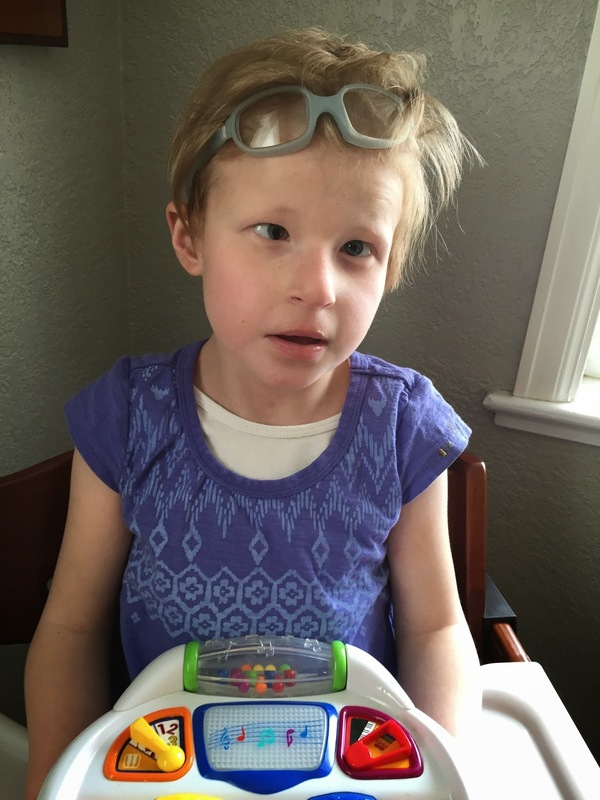 We will keep trying our best to find that balance, that sweet spot, between enough medication to keep seizures away and as little medication as possible so that we can know Julia as best as possible! It's going to be our lifelong challenge. And we are happy to do it because she is so very worth it! And so for now we believe we are gaining some ground in our challenge! Since starting medical marijuana (and getting off of Keppra) Julia's agitation has decreased quite a bit. She has attempted some new communication strategies which have been exciting to experience, and she has been very attentive and in-tune to the people around her. For example, today we visited with friends who have a 1 year old. Several times I caught Julia stealing sideways glances at little Rosie. She shared her iPad (sort of) and when Rose gently grabbed for Julia's hair Julia did not freak out at all, she just moved a little to the side and continued watching Veggie Tales! These are all really big developmental steps for Jules! Another example of this progress; last week we went to visit the four week old puppy we are getting for Julia and during our visit she let the puppy put his paw on her hand. Seriously, the puppy put HIS PAW on HER HAND and she allowed it!!!!! I cannot over emphasize the enormity of this type of development. The girl is getting the chance to be comfortable in her own skin and it is glorious to witness! Julia and Macaroni aka "Mac"
In the past eight weeks our story has been shared and we have received so much support for which we are very grateful! (And some constructive feedback as mentioned above, but mostly support.) One supporter repeatedly encouraged us not to give up! Don't give up! Don't give up! I found this to be so sweet and I love the encouragement, but it was also a little confusing because we have absolutely no intention of giving up! We are thrilled by what we have seen so far and this is only the beginning. We have so much hope for what is ahead with Jules taking marijuana. If anything we are more determined than ever to spread the word about how this is working for our family in hopes that more families will get the chance to try it. More families, in their own home state or country, without having to disrupt their lives, leave their people and become medical refugees in Colorado, will be able to give their loved one this chance at life with fewer seizures - we can do this! Please get involved, please spread the word, please help us legalize medical marijuana on the federal level so our friends can return home and we can go to the beach! Thank you! I just stumbled across your blog and wanted to take a minute to thank you for posting your story. I'm the dad of an IS kid, and I think that marijuana sounds so promising for our kids. Its frustrating that access to it is still limited for so many people. I hope you and Julia are still doing well! There are some significant historical figures and famous people who smoke marijuana who made important contributions to the development of cannabis. Recently heard about the superstar who had a habit of intercepting joints as a teen. It makes me so happy to see that she's doing so well! Don't ever let anyone bring you down because the medicine that works for her is "bad". I think it's about time for those preconceived notions to fade out already.